In the way of the accountant, a product is intended to maximize the profit for the manufacturer; quality is sacrificed to meet a price-point. In the way of the craftsman, a product is intended to maximize the enjoyment for the owner; price is determined by the quality. This is true for furniture, wine, clothing, and certainly audio equipment. In the way of the accountant for audio equipment, quality is not the focus; the accountant will team up with the marketer who will invent a problem which only his product solves, or perhaps introduce some new feature that he can hype. The hype side-steps the issue – this new feature was designed to a price-point and thus does not alter the lack of quality that that price-point dictates. Dave Davenport at Raleigh Audio sees an important difference between perfection and excellence. That difference is that perfection is terminal – when something is perfect, you stop your efforts to improve it. It doesn’t speak to quality – it only depends upon the goal – the accountant will deem a product perfect when it meets its price-point. The craftsman doesn’t think of perfection – rather he focuses on the pursuit of excellence, which leaves open the door to continuous improvement in product quality. Planned obsolescence is the tool of the marketer. A craftsman’s product never becomes obsolete. The craftsman knows that quality is a nebulous concept, but is easily recognized by the connoisseur. As the quality of the Raleigh Audio products get better, the improvements come in smaller increments – but they come. Year after year they come. Dave’s biggest challenge is where to stop – or perhaps pause – in this pursuit of excellence. He has set markers along the road in the form of the “Mark” designation – now at Mark IV. Thankfully, there is no hype on this road to excellence – the good just gets better. And the real good news is that last year’s product is not obsolete by this year’s product. Many folks are very happy with the excellent performance of their ten-year-old RAKK product and we usually don’t recommend upgrading for a less than two-Mark difference. The RAKK products have staying power. Along these lines, in order to allow the DIY enthusiast the experiment with modifications on a unit that has not already been optimized, Raleigh Audio now offers the opportunity to choose a point of excellence along the road. This is accomplished by, where it makes sense, offering two versions of a product: a Standard version and a Premium version. The two versions share the same basic structure, with the Premium version additionally benefitting from the extensive improvements. The Standard version, forgoing the latest improvements, provides the DIY enthusiast the opportunity to participate in the improvement process. Even without any improvements, the Standard version regularly embarrasses most consumer products that were designed to a price-point. The Premium version, having incorporated all of the latest improvements, offers sonic excellence comparable to the best on the market. Raleigh Audio also offers assembly and test service for those who would prefer to purchase a finished unit. The evolution of the digital and analog circuitry designed by Dave Davenport at Raleigh Audio has continued, with the aim of providing ever better sound, yielding a true high-end audio digital-to-analog converter. The Extreme RAKK dac consists of an attractive enclosure containing a RAKK dac (described below,) an Active Output Stage (described below,) various digital input circuits, together with the necessary powering. 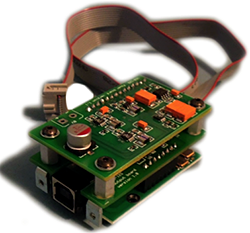 The Extreme RAKK dac is designed for flexible configuration. Up to six digital inputs and two stereo output pairs can be accommodated on the back panel. This unit has sonics superior to all of the mid-priced DACs that we have auditioned, and challenges some of the real heavyweights in the business, as well. To facilitate your decision-making process, we have developed an auditioning program that allows you to have an Extreme RAKK dac in your audio system for 10 days to decide if it is the DAC that meets your needs. Call for details. Raleigh Audio Extreme RAKK dac, front and back views. I was quite happy with the MKIII version (actually, entirely satisfied with it), but the new version is a truly impressive improvement. It has greatly increased detail retrieval, coherence, and an apparently lower noise floor which yields much more realistic imaging, greater dynamics, and stronger bass response. This was evident within the first 15 seconds of listening. Instruments or voices are precisely located in width and depth on the image stage, with very engaging ambience retrieval. The sound is just more real for all types of music: vocals, four-piece jazz, symphonic, rock, etc. It has a lot of the qualities of high-end vinyl now. I’ve listened to CDs as well as high res downloads and DVD audio up to 24/192 — the high res content is smoother, but I’m amazed with the quality from CDs. Some that I’ve previously judged to be edgy or harsh now sound clean and detailed, and this is nothing like a smoothing filter effect. The MKIV just provides a cleaner and more revealing version of the digital information. Two versions of the Extreme RAKK dac are available – a Standard version and a Premium version. While the Standard version uses good, in many cases generic, parts, the Premium version uses top-quality parts throughout. Both versions are available either as kits or fully assembled and tested. Front panel switch selectable digital inputs of various types. Both balanced (XLR) and unbalanced (RCA) outputs. There is no sonic compromise in choosing one over the other. Note that the RCA and XLR jacks are not isolated from each other, so you may not be able to use them simultaneously and preserve the balanced operation of amplifiers being driven from the XLR/balanced outputs. 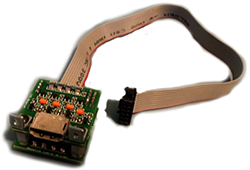 The assembled and tested Premium Extreme RAKK can have analog inputs. A mix of digital and analog inputs constitutes a “Hybrid” unit. Single-ended (RCA) and balanced (XLR) analog inputs are available on an assembled Premium Extreme Hybrid. A maximum of five analog inputs can be accommodated on the Hybrid. Because this is an individual custom unit built on a Premium DAC base, it is available only on an assembled Premium unit. The Hybrid option is not available on the kit version or the Standard version. 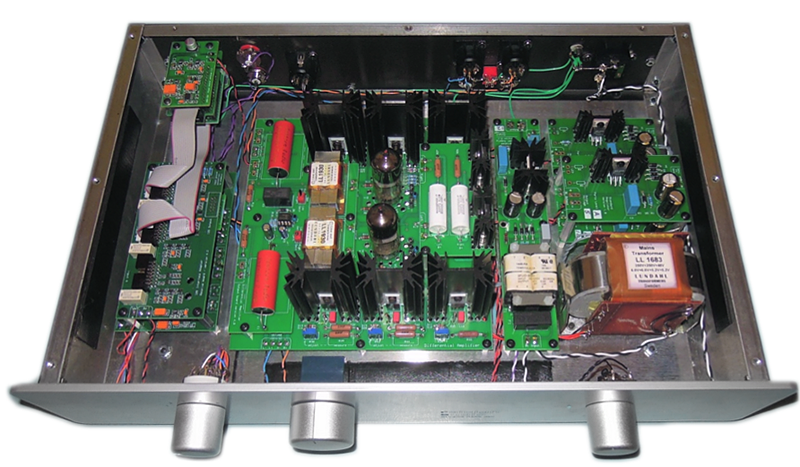 A Standard Extreme RAKK dac with a silver faceplate shown assembled and tested. Of course, the primary difference between the Premium version and Standard version of the Extreme RAKK dac is in the sonic performance. While the Standard version is by no means a slouch in its auditory performance, the Premium version provides a very noticeable improvement in the sonic presentation. While I am not a big fan of measurements, there are differences in the measured parameters between the two versions: notably in the output level and output impedance. The design point for the analog circuitry is to provide 2VRMS output for 0dbFS input. This is achieved for both versions if no volume control is present. However, there is a difference in the maximum output available between the two versions if a volume control is present. With a volume control, the maximum output available from the Premium version is still 2VRMS, while the maximum for the Standard version is 1VRMS. The details of just why this is so are presented in the discussion of the K&K attenuator (below.) 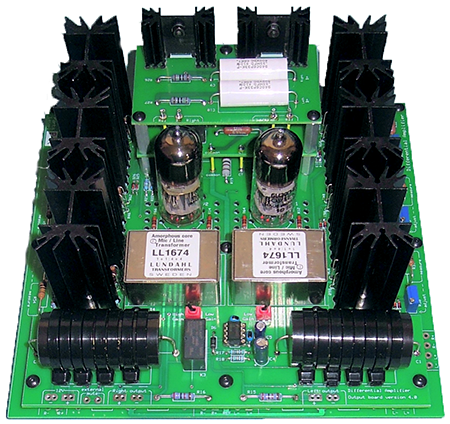 Like a small power amplifier, the output of the Extreme RAKK dac is driven by a transformer. The low output impedance of both versions provides robust performance into just about any preamplifier or power amplifier. Because of the different winding ratio of the transformers used in the two versions, the output impedance of the Standard version is 210 ohms and the output impedance of the Premium version is 310 ohms. This difference is immaterial to the sonic presentation. The Premium Extreme RAKK dac provides a high-end DAC comparable to the best on the market. The Standard Extreme RAKK dac is intended as “entry-level” product that competes favorably with well-respected products selling in the retail high-end audio market for $3500-$4500. Furthermore, a Standard Kit is upgradeable to the sonic equivalent of the Premium Kit if you should choose to do so later, so your purchase is not a “dead-ended” investment. State-of-the-art Digital to Analog converter supporting three serial SPDIF-type inputs and one parallel I2S input. The I2S input can support either I2S or USB. I am sure you are aware that the RAKK digital audio products offer not only great audible performance but great value for the cost. As with the other RAKK products, the RAKK dac has been progressively perfected. The improvements have accumulated and the result is now at Mark IV status. My personal opinion of the quality of sound provided by the Mark IV was so great that I removed the Mark III boards from the Sonus Veritas Modena dacs and installed the Mark IV alpha-level boards so we could use them at the 2012 Rocky Mountain AudioFest. We were rewarded with many comments to the effect that the sound was detailed, but very natural, several even venturing that the reproduction resembled what they might expect from live music. Great praise, indeed! 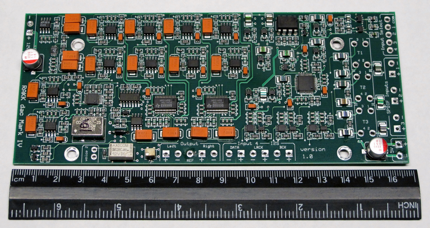 Much of the technology on the Mark IV board will be familiar to you from the Mark III. The excellent PCM1794 DAC is still there as is the equally excellent SRC4193 input receiver and sample rate converter. The sonically superior high-end opamp-based series regulators are also still in use. However, there are several important differences between the Mark III and Mark IV that contribute to a dramatic improvement in the quality of digital music reproduction. The designer, Dave Davenport of Raleigh Audio, has added another PCM1794 DAC chip so that each dac is operated in “mono mode”, meaning that both DACs in each chip are serving only one channel’s data stream in a differential configuration, resulting in greater linearity and higher current output. Each of these DAC chips is receiving reference current from a new reference current source that we have developed, which is responsible for a dramatic improvement in sound quality. On the digital side of the equation, the Mark IV uses a high-specification low-jitter oscillator to provide the lowest level of clock jitter. To complete the picture, Dave split the supply feeds to the Mark IV board into two inputs; one supplies all of the especially critical circuits, including the oscillator, and DAC chips, while the other serves the supporting functions. The PC board is 6.6″ x 2.8″, and uses the same mounting screw spacing as the Mark III, allowing easy upgrade. The power supply requirements are 10VDC @ 300mA and 5VDC @ 100mA. This differential class-A triode parafeed output stage is a further refinement of the circuit, now in its fourth generation, first used in the excellent Raleigh Audio Line Stage detailed in the November 2004 issue of AudioXpress. The circuitry is fully balanced from input to output. The input section of the Active Output Stage includes passive current-to-voltage (I/V) conversion that provides two equal signals of opposite polarity for the output section. The output section of the Line Stage provides a transformer-coupled circuit in a bridged parallel feed configuration that was used by Western Electric over 60 years ago. However, it employs a cascode connected depletion mode MOSFET constant current source (CCS) that is more effective than anything available to Western Electric engineers. The amplifying device is a robust Russian dual triode, one per channel. A Lundahl transformer in each channel provides for both balanced and unbalanced outputs. The Active Output provides an interface for an optional volume control. Either a standard 10K to 50K stereo audio potentiometer or K&K Audio’s shunt attenuator can be used to control the volume. (see Stepped Shunt Attenuator below). 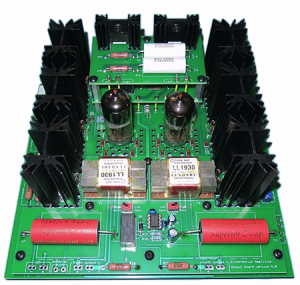 Advanced Minimal Reactance Power Supply circuitry is incorporated into the Active Output board is designed to work with a Lundahl LL1683 power transformer. 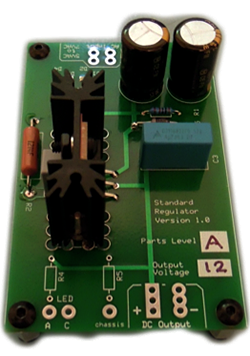 A 12VDC, 65mA, power supply is required to power the relay on the Active Output board. Two versions of the Active Output are available – a Standard version and a Premium version. While the Standard version uses good, in many cases generic, parts, the Premium version uses top-quality parts throughout. 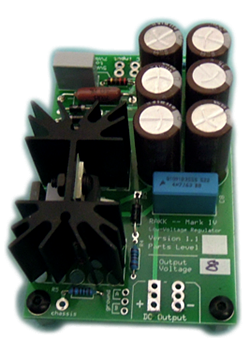 The RAKK Passive Output provides the very basic needs for a current-output DAC to be interfaced with a preamplifier. I am often asked “What is the best digital interface?” The answer is here. To be used if you have only one I2S input and no USB input. “Share the Road” may be fine to conserve our presious natural resources, but “share the power” does not provide optimal results in an audio component. The name of the game for the best results is isolation of both power and ground. Thus, instead of a single large power supply which is shared by all of the components, we provide a small individual power supply for each audio component. The Low Voltage Power System components are intended to provide the required power for the various digital components. Two types of power supply components are provided. First, are voltage regulators that are intended to be used with the Lundahl LL1683 power transformer. Second, are stand-alone regulated power supplies that may be powered with Mains power. Both the regulators and power supplies are offered as Standard and Premium versions. The Standard family of supplies is intended to provide adequate power for the Standard version of the DAC and its adapters. The Premium family of supplies is intended to provide superb power for the Premium version of the DAC and its adapters. The power supplies may be powered from 115VAC or 230VAC and the output current capability depends upon the output voltage. The current capability of the regulators depends upon two factors – the input voltage and the output voltage. The following output voltages are available: 5V, 8V, 10V and 12V. This chart on the Raleigh Audio website will assist you in choosing the right Regulators and power supplies for your application. Those of us who are using differential tube preamp circuits like the Raleigh Audio active output stages or Lynn Olson Raven-style preamps have had to use conventional audio potentiometers or their discrete resistor analogues, like the DACT or Goldpoint controls to provide control of volume. You can review the choices for volume control implementation in these types of preamp circuits below. We prefer the implementation with one variable element per channel, the so-called “U” or balanced shunt attenuator. It is simpler and cheaper and has the significant virtue of causing no change in common mode rejection as different volume settings are used. So what is special about our implementation of the “U” attenuator control? A standard audio potentiometer or discrete resistor analogue has a resistance profile (called a “law”) that is configured for standard series attenuator use, not shunt attenuator use. You will probably have to trust us on this, but the math is not the same. 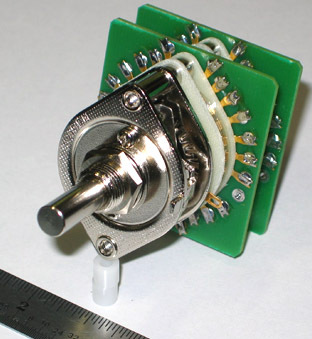 Hence, when you use a smallish value of series resistance and a large value audio pot to make a shunt attenuator that won’t cost you very much lost gain in the maximum volume position, you will get a control where most of the volume attenuation capability is in the first third of the rotation from zero volume to maximum volume. That’s not really what you want, obviously. To fix this situation you can use a series resistor value that is approximately the same value as the pot and now the shunt attenuator performs more reasonably, so that attenuation is spread more evenly over the rotation of the pot, but you lose a fair amount of gain at maximum volume setting. (approximately 10dB in the case where the pot is the same value as the series resistors). Compromises, compromises…..
To avoid these compromises, we have designed the resistor values used for the stepped control to provide equal dB volume intervals (1.5dB) with 5K series resistors, which result in a reasonable 10K input impedance at minimum volume setting. Of course, any kind of volume profile can be implemented with discrete shunt resistors, however this one has proven to be useful for me for the 2 years I’ve lived with such a control (implemented in my case with a much bulkier (and slightly inferior sounding) array of Holco resistors). To be fair, there is a compromise inherent in these controls, too; that is price. Using Seiden 32NEG switches specially imported by us for this purpose, these are not inexpensive, but are reliable, sound excellent, and have a wonderful “feel”. In my experience, no audio potentiometer provides the sound quality that these stepped attenuators do. 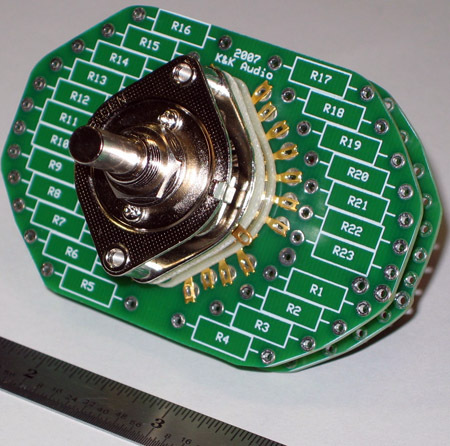 Two views of the surface-mount Stepped Attenuator, and one of the through-mount version. 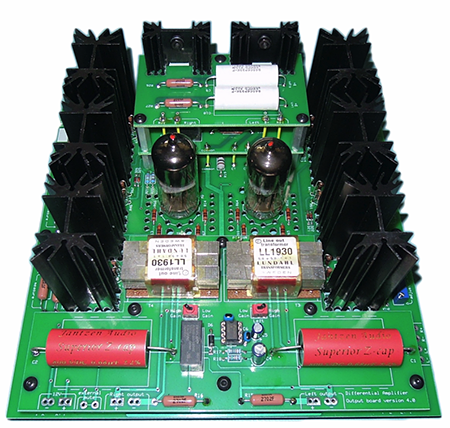 Note that you can also utilize these attenuators in single ended circuits with a single 10K series resistor per channel without any other changes. We auditioned several candidate resistors for these attenuators and selected Vishay parts for their sonic properties. 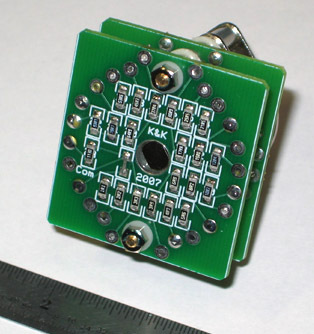 Surface mount resistors have the advantage of making a compact 23 step attenuator possible. The finished attenuator is little bigger than the Seiden switch that it is based on. 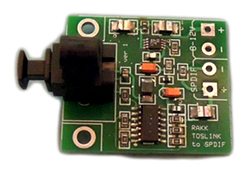 The SM attenuator is not a kit; it is supplied with all of the SM resistors already soldered in place. Each attenuator is also supplied with 4 (2 for each channel) 4K99 Mills MRA-5 resistors for the series resistors, unless you have purchased the Combo Input Stage Kit, which already comes equipped with the appropriate series resistors..
We are also offering a kit of parts including the Seiden switch and PC boards that will accommodate standard through-hole leaded resistors (like Holco H4, Caddock MK-132, naked Vishay or Kiwame 1w resistors; Rikenohm or Allen Bradley 2w resistors are too large) so that you can use your favorite resistors and concoct your own shunt attenuation profile. Obviously these are considerably larger than the SM resistor-based attenuators.